This comprehensive program is for yoga instructors, classroom educators, administrators, directors, counselors, physical and occupational therapists, speech pathologists and anyone who works with children, ages 3-17, and has the mission of bringing out the best in them. NKYTT trainees learn the many ways that yoga can create joy; promote the healthy physical, emotional and social development of children; and help them develop life-long healthy habits. Based on current cognitive neuroscience research and evidence based education pedagogy, NKYTT utilizes the best practices of yoga, mindful education, creative arts and play, precepts of social emotional learning (SEL) and social emotional competency (SEC), and guiding principles of positive psychology. Mindfulness for Educators Training makes mindfulness accessible and relatable and easy to implement in the classroom. The program is founded on the principle that the teacher sets the emotional tone for the classroom and offers participants practical tools to maintain a calm classroom, fostering a harmonious and healthy learning environment. Join us at Freedom Within Yoga studio, for a special evening of the Oneness Meditation with facilitator/teacher Catherine Scherwenka and Joyce Sinclair. The Oneness Meditation is simple, and extremely powerful. Catherine and Joyce will guide our way through the evening. We will begin the meditation by first settling into ourselves and feeling our own internal state. In an atmosphere of support, we simply connect with our breath and all that is present within our lives. After centering, we will open our eyes and gaze into the eyes of Catherine and Joyce, who will return the gaze, creating a special conduit of energy. This is the energy that the ancients call ruach or life force energy. When this energy is flowing fully, we feel good, we feel able to meet the difficult challenges in our lives, we are able to more easily forgive and make good decisions. When this energy is able to move freely through our body and mind, we feel our own innate goodness. We feel the interconnectedness with others and the world we live in, we feel the Oneness. The last part of the Oneness Meditation is the integration. If you have ever practiced yoga, the last part of the practice involves a quiet rest so as to allow the practice to soak into your bones, muscles and spirit, deepening the experience of the practice. Here, we will take a few moments at the end to integrate and anchor our experience. The Oneness Meditation is free of charge. Eight week Spring Session with Lateefah! Pre-registration is a MUST for classes: $108 per class for the 8-week session. For any payment inquiries, please email me. Would you like more patience with your kids, boss, partner...yourself??? Maybe you need to find a way to give yourself the down-time you need in your fast-paced world. A wonderful way to begin 2014: gathering the tools to help you balance everyday life and your mental sanity!!! Go to www.empowerfitwellness.com to pay for workshop in advance. Click on the Pay-Pal link to reserve your spot….Space is limited!!! Remember: Being well is more than just a good workout. It is a true balance physical fitness, mental clarity and a content heart. 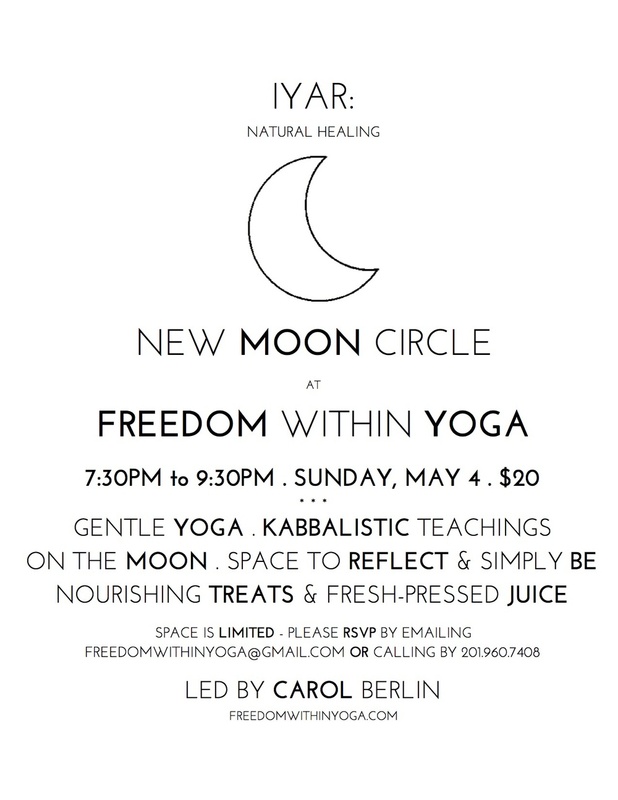 Carol Berlin, Director of Freedom Within Yoga will be teaching her third 200 hour yoga teachers training with Kinneret Yoga beginning in September 2016. -Open to women of all faiths and backgrounds.